In the Season 3 season opener (here in the States) Carson the Butler laments “Where’s the style and where’s the show?”. Times they are a-changing and change is coming full force to that little backwater pile in Yorkshire known as Downton Abbey. As Carson and the downstairs staff labor on to provide the same level of fabulousness of days gone by with limited staff members and financial constraints, those above stairs are also trying to keep up appearances. The big deal of this episode, which mainly served to remind us who all the characters are and their various story lines, was the long-anticipated introduction of Shirley MacLaine as Countess Cora’s wealthy American mother, Martha Levinson. Mrs. L is a widow about which we really know very little other than she’s fabulously wealthy, has homes in New York and Newport and the money came from tin. In the days of The Gilded Age, the original Masters of the Universe with names like Vanderbilt and Astor made their money in commodities such as steel, coal (and presumably tin), precious metals and in transportation. The summer “cottages” in Newport were palatial affairs that were often inspired by European country castles. Social customs were exacting and the grand dames were elegant, well-traveled women of good breeding and education. As a still young country, rich or no, we still looked to our European forebearers for approval and many a young American heiress was shipped off with a bundle of family cash to marry into the European nobility who was simultaneously coming to the end of their inherited fortunes. Much like our Countess Cora did when the Levinson family tin money saved Downton some thirty years prior to the story line. And so, we anticipated a clashing of cultures when Mrs. Levinson came to visit – especially as foil to the estimable Violet, the Dowager Countess as played by Dame Maggie Smith. These two great actresses, playing two grande dames, should have been great fun to watch, and of course they were. Where old meets new, tradition meets modernity and witty bon mots begets bitchy comeback. Ms. MacLaine didn’t disappoint – except in one glaringly bad scene where she was not so much chewing the scenery, but chewing it with her mouth open, cutlery flying. There are others who can speak to manners of the day much better than I, but seeing Mrs. Levinson eating while talking, never putting down her fork or knife and generally acting fairly boorish at the dining table was really a great disappointment. It was certainly a stereotypical portrayal, one that assumes American’s are ill-bread clods. It’s also hard to imagine how such a bore could have raised Cora whose behavior is always modulated and appropriate. No, it really was just a ham-handed portrayal and it’s a shame that either Ms. MacLaine wasn’t capable of pulling off a more nuanced character or writer/co-creator Julian Fellowes simply doesn’t understand his American history very well. of America’s most prominent buildings across the country. Ogden Codman decorated the family quarters. The aerial views certainly show off the massive (65,000 sq. ft) scale of the mansion. If you ever have a chance, take the Cliff Walk around the water side of the mansions, it’s a must-do! I did it on a very cold, New Year’s day a few years go – I’d suggest a nice May day instead! Up the grand stair case. The dining room. One assumes there are many yards of table leafs stashed somewhere. The loggia overlooking the Atlantic. Rosecliff: Designed and built between 1899 and 1902 by Stanford White of McKim, Mead & White for Hermann and Tessie Oelichs. Hermann Oelichs was from a prominent Baltimore family that stretched back to the signing of the Declaration of Independence and Tessie’s father made millions as a partner in the famed Comstock Lode gold and silver mines. The house is modeled after the Petit Trianon in Versailles and has four stories, though it gives the impression of having only two. This a decidedly feminine structure which featured a gorgeous double curved main stair case. Rosecliffe was used in the movie The Great Gatsby starring Robert Redford. The sitting room – decked out for Christmas. House was built between 1888 and 1892 for Mr. and Mrs. William K.
palaces. The house was designed by the architect Richard Morris Hunt, inspired by the Petit Trianon at Versailles. Alva’s Chinese Tea House on a bluff overlooking the ocean. 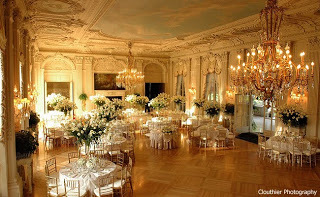 Visit my Downton Abbey Board for Newport Mansions for additional images, links and credits for all of the above above. My friend Vic of Jane Austen’s World blog has a wonderful post on the fashions of the 1920‘s. Tom and Lorenzo are covering the show again in their fabulously opinionated fashion Here’s their recap of Episode One – Let Me Call You Sweetheart. Gotham Tomato, aka Deborah Gilbert, blogs on The Downton Dish for New York PBS affiliate WNET. Season 3, Episode One is available online here.